Modern Calligraphy has come back in a big way. 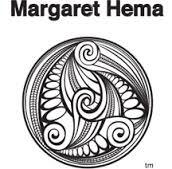 And luckily the people of Wellington now have access to a great class that can show them how to do it with a flourish. Beautiful handwriting is something we all admire. In a typing age, however, it is fast going the way of the Dodo. 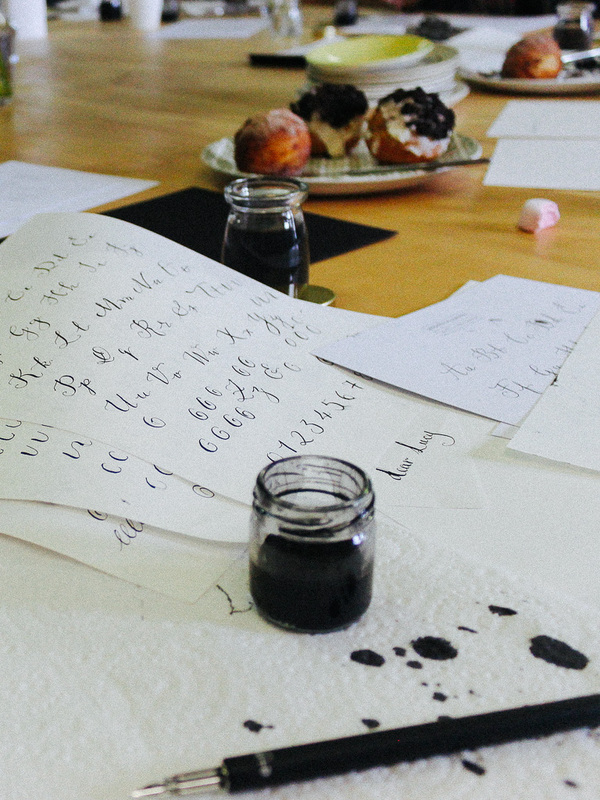 Recently, as a sort of backlash (think about how LP’s have come back into style with MP3s being the norm now on iTunes) calligraphy has become a popular pastime across the world. Those of you who are obsessed with Pinterest will know you can’t move without running into a cursive alphabet. I had been interested in Calligraphy since coming across the work of Haly Lai. 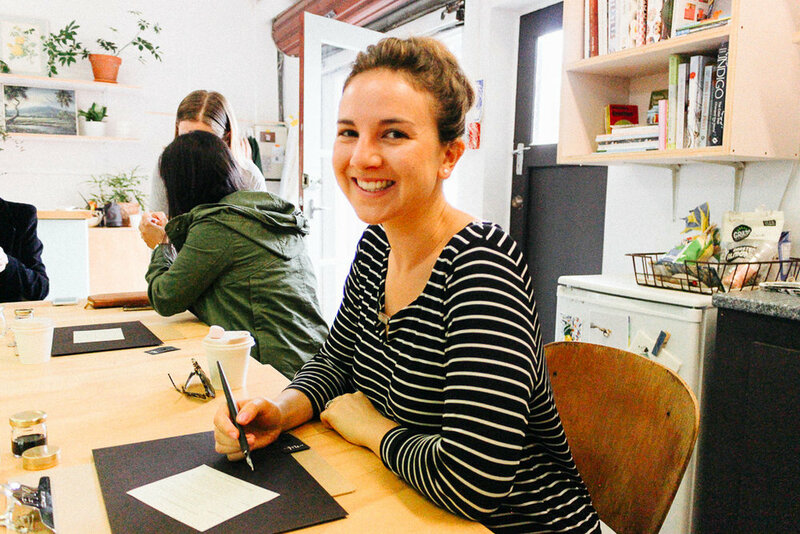 In addition, I’d seen a vlog a while ago from my fav blogger Lily Pebbles about a calligraphy class she attended in London. As far as I was aware, however, no such class existed in Wellington. 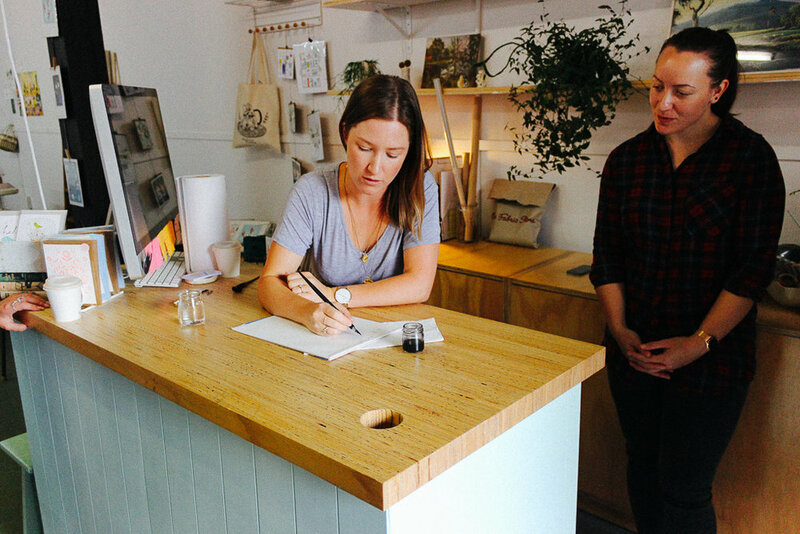 Luckily, Calligrapher Natasha Linskill reached out to me to find out whether I’d like to come to her newly formed modern calligraphy class in Newtown in a few weeks time. I agreed, loving the idea, although with no clue about what to expect. Natasha kindly allowed my darling friend Maria to come along as my ‘plus one’. I couldn’t wait! We arrived on Saturday morning slightly late after we’d both read the address wrong. Once we made it, we happily were told that we should go next door to Rich Coffee Roasters (who I’ve been wanting to try for aaaages) and to order a coffee. 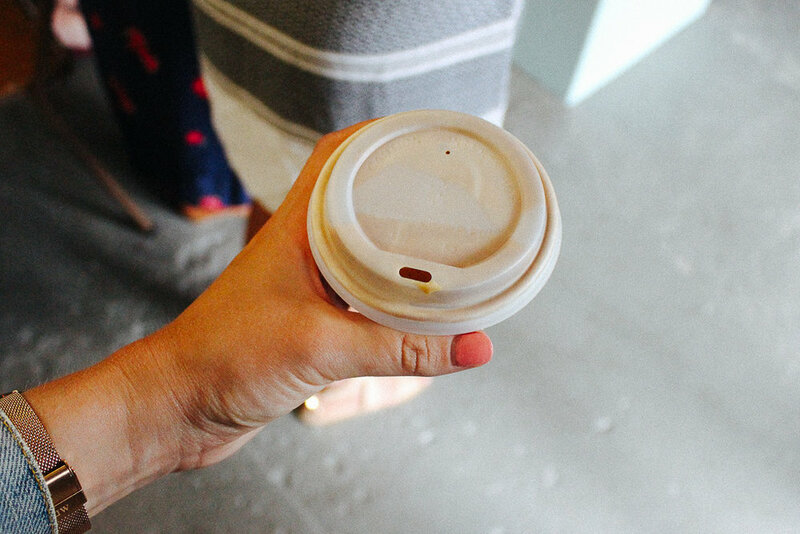 I broke my coffee ban which I’ve been on in January (I still am coming to the blog post, hang tight!) and ordered a flat white - my second coffee of 2018 (I had one in Marlborough at Wairau Valley when I was a bit pooped from riding bikes and drinking wine). Once back in the beautiful neighbourhood studio where the class was hosted, we immediately spotted a friend of ours, Yvonne. 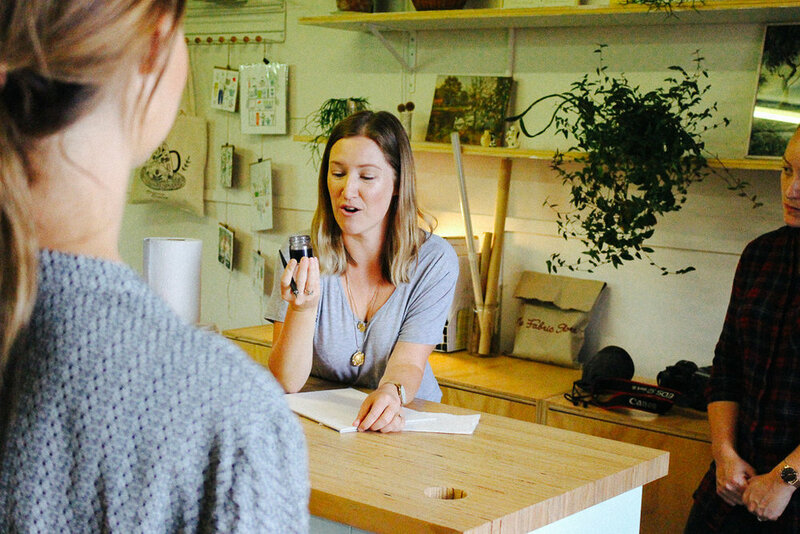 Natasha was explaining how calligraphy ink and paper worked, and why you can’t just use any old ink or paper. She also showed us how to load our nib with ink and how to hold the pen. On the table behind us, sat a hearty array of doughnuts and some beautiful palms. Our kits were laid out on the table, our names drawn by Natasha herself so we knew where to sit. Maria and I took our seats and started to play with our pens. The atmosphere in the class was very relaxed and friendly, with lots of lovely women altogether. Natasha was able to attend to us all, and answer all our questions because it was a reasonably small class. I set out filing up my own nib with ink and making strokes on the page. 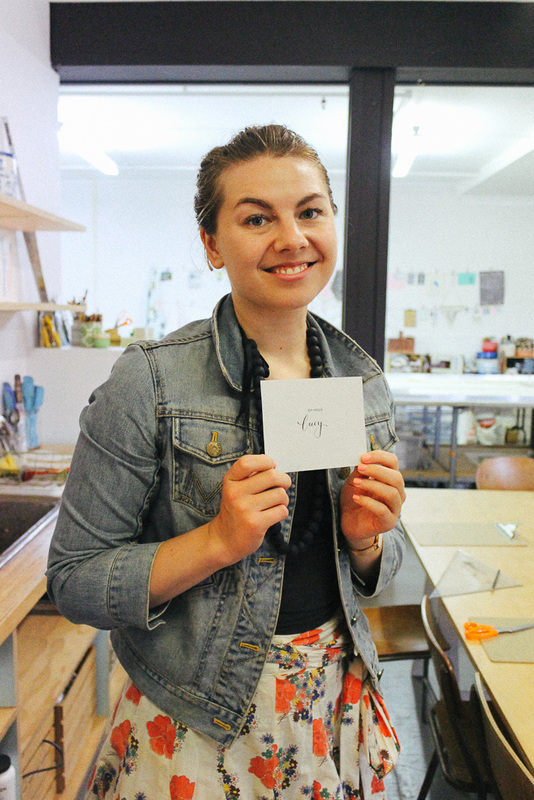 At first, we just traced the set shapes that were on the practice pages Natasha included in our kit. The pages of the paper we had were semi-translucent so it was easy to get going. Natasha was able to help me when I went a bit wonky, and suggested press less hard and stop changing my angle rather than using pressure to change the shape of the letter. The whole experience was very relaxing and interesting indeed. Once we had given the practice sheet a go a few times it was time to get the alphabet. Natasha laughed as she told us ‘P’ was the letter she always struggled with. The practice sheet alphabet was Natasha's own style. She admitted her letters tend to have an unusual downwards curve at the end. After this, I practised writing my name a few times before I was ready to practice freehand. Writing freehand was much more challenging and eventually, I decided to come back to the sheet to practice a few more times. After that, I felt like I could do it better. Practice makes perfect! I decided to write a cheesy valentines message for Matt (“I want your Ginger kisses” - *bleugh*) and played with different sizes (although Natasha said the nib we had was generally not appropriate for bigger fonts. However, by trial and a lot of error, I was happy with the result. 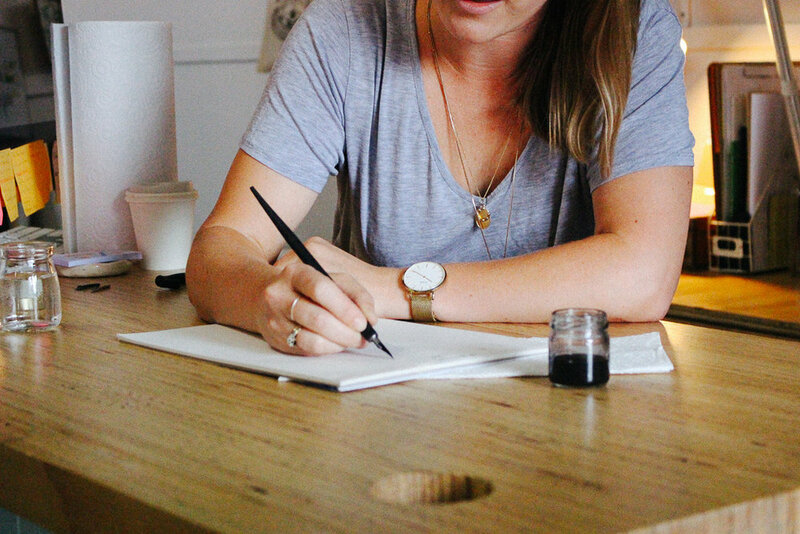 Modern calligraphy with Natasha truly is for everyone. Unlike many classes, it is a good length for a Saturday morning (just 2 hours) and I would happily come back every week to improve! For $110 each, you get a coffee, doughnuts, and all the tools and paper you need. I couldn’t recommend doing a modern calligraphy class with Natasha enough and I hope I’ll get another chance to do one in the future!